Our goal is the exchange by people on the Internet of information and views about activities and media that promote a culture of peace. Hence we measure progress by the number of people reading our sites and writing or discussing reports about what they are doing, seeing or hearing. In this respect, our progress is still very modest. We started off the decade with sites in different regions of the world, but several of the sites were not maintained and now there is only one site with a regular flow of news, CPNN-USA (http://cpnn-usa.org), and two sites with less activity, CPNN-AUSTRALIA (http://www.cpnn.org) and CPNN-JAPAN (http://www.cpnn.net). One aspect of progress has been to combine discussion with news. At the CPNN-USA site, the news report appears on one side of the Internet page and its discussion on the facing side. This innovation has produced a certain degree of dialogue and debate, but is still not utilized to its full capacity. Our main indicators are the number of visitors to our sites, how long they stay, and whether they write a report or a discussion reply. The biggest obstacle to the success of our efforts is the lack of participation of our readers. They are invited to write as well as read, but few take the opportunity to do so. This is a major obstacle to our progress, because all our reports come from readers. We believe that true education for peace must be active and not passive. Unfortunately this approach to education is not yet sufficiently developed. Most people seem to be content with passive receiving of news from television or Internet, and they do not take the step of participating actively in making the news. Hopefully, the potential of Internet as a means of two-way, participatory communication will be increasingly realized in the coming years. CPNN actions may be seen directly on the Internet. They directly promote a culture of peace because each report must promote at least one of the domains of a culture of peace and no report may contradict any culture of peace domain. 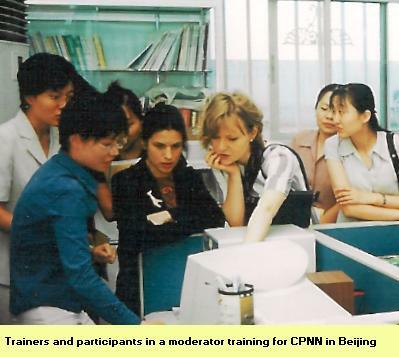 The reports on CPNN-USA are available on-line at http://cpnn-usa.org . Those of CPNN-Australia are on line at http://www.cpnn.org. And those of CPNN-Japan are on line, but only in the Japanese language, at http://www.cpnn.net. The original format were simple reports, but additions were made to this format in the USA version, including a commentary BulletinBoard feature which is posted alongside the report and which receives debate and dialogue based on the reports. We hope that the General Assembly, the Secretary-General and the Member States will encourage and strengthen development of civil society and its contributions to a culture of peace. It is a good beginning that the report of the panel of eminent persons on UN-Civil Society relations (A/58/817) has recommended that the General Assembly should include civil society organizations more regularly in its affairs rather than restricting them to ECOSOC. Hopefully, this report at the midterm of the Culture of Peace Decade will be a good precedent. The original Programme of Action on a Culture of Peace (A/53/243) called for development of a global movement for a culture of peace. Surely the world needs this movement now. CPNN-USA belongs to the national network of United for Peace and Justice in the United States. In Japan, CPNN is linked to several networks for a culture of peace, as well as the UNESCO Clubs and Associations. Our plans are to establish websites in all UN languages by the end of the Decade, and in all regions of the world, in order to make available daily news on the Internet about how people are promoting a culture of peace.